If data aggregation is a breeze for you, but your resume just makes you aggravated, check out our midlevel database developer sample for inspiration. To be a successful candidate for tech jobs, resume expert Kim Isaacs says it helps to have a comprehensive resume. 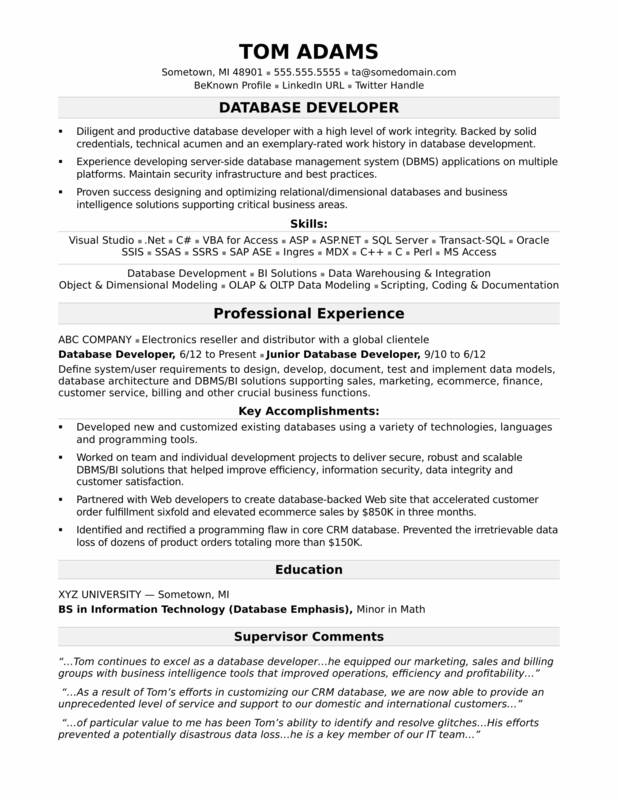 If you have no problem with data aggregation, but your IT resume just makes you plain aggravated, check out this sample resume of a midlevel database developer that Isaacs created below. You can also download the midlevel IT developer resume template in Word. And if you need more help, get a free resume evaluation from the experts at Monster's Resume Writing Service. Jobs for IT developers are projected to grow by 24% (or 302,500 jobs) from 2016 through 2026, according to the Bureau of Labor Statistics (BLS). You’ll find the highest level of employment for this job in the following states: California, Massachusetts, Texas, Virginia, and New York; and in the following metropolitan areas: San Jose, California; Washington, D.C., Boston, New York City, and Los Angeles. In this job, you can expect to make a median wage of $103,560 per year, or $49.79 per hour, according to the BLS. Diligent and productive database developer with a high level of work integrity. Backed by solid credentials, technical acumen and an exemplary-rated work history in database development. Experience developing server-side database management system (DBMS) applications on multiple platforms. Maintain security infrastructure and best practices. Proven success designing high-integrity relational/dimensional databases and business intelligence solutions supporting critical business areas. Define system/user requirements to design, develop, document, test and implement data models, database architecture and DBMS/BI solutions supporting sales, marketing, ecommerce, finance, customer service, billing and other crucial business functions. Developed new and customized existing databases using a variety of technologies, languages and programming tools. Worked on team and individual development projects to deliver secure, robust and scalable DBMS/BI solutions that helped improve efficiency, information security, data integrity and customer satisfaction. Partnered with Web developers to create database-backed Web site that accelerated customer order fulfillment sixfold and elevated ecommerce sales by $850K in three months. Identified and rectified a programming flaw in core CRM database. Prevented the irretrievable data loss of dozens of product orders totaling more than $150K. "...Tom continues to excel as a database developer...he equipped our marketing, sales and billing groups with business intelligence tools that improved operations, efficiency and profitability..."